Our new ROADMAP TO CONTROL EXCELLENCE provides you with a review of your current control framework as a practical first step towards achieving compliance with SOX or other financial regulations. It helps you understand how to quickly and effectively improve internal control based on an internationally-recognised standard and identify potential cost savings in your control environment. We undertake your review using the five components of the COSO Internal Control Framework (see below). The result is an action plan that shows you how to achieve practical, realistic and cost-effective improvements to your internal control environment. Monitoring Activities – we look at how internal control is evaluated and assess whether all elements are designed and operating effectively. We will also highlight whether deficiencies are made sufficiently transparent across the organisation. Once we have completed your review and delivered your report, you are free to use it to commission any control framework you choose. 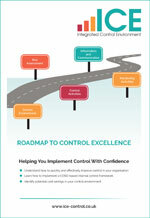 The Roadmap to Control Excellence costs from just £2,995. Get in touch today to book your discovery meeting. The Roadmap to Control Excellence uses the internationally-recognised framework of principles developed by COSO – the voluntary private-sector initiative dedicated to improving organisational performance and governance through effective internal control, enterprise risk management and fraud deterrence. Download full details HERE or book a Roadmap to Control Excellence discovery meeting here.